As only a small number of refugees are eligible to enter European countries, the ones that can find shelter suffer from worsening humanitarian conditions in refugee camps, as the new camp built in the northern French city of Calais exemplifies. An 18-hectare wasteland in the French port city will be turned into a camp for as many as 2,500 asylum seekers. Hundreds of migrants will be relocated by French authorities by the end of April to the site, dubbed "The New Jungle," where there is no access to basic services. "This is the worst camp for war refugees in Europe, if not in the world," Christian Salomé, director of the voluntary civil society organization L'Auberge des Migrants, told the Local France on April 3. "It is probably the only camp in the world where there is so little water. There is only one water point and some people have to walk more than a kilometer to access it. This is unacceptable. 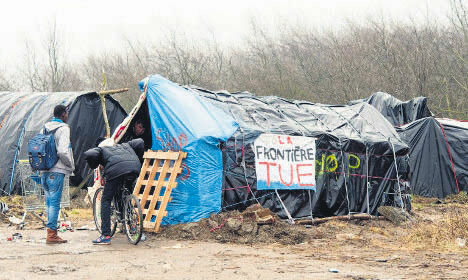 There are no toilets either," revealing the humanitarian situation in the northern French port city of Calais. Most migrants coming from the eastern African countries of Eritrea, Ethiopia and Sudan and war-torn Syria intend to cross the English Channel and seek asylum in the U.K. In Germany, many Syrians who have fled from war face violence and discrimination in camps. Recently, an arson attack burned down a new refugee shelter in the eastern town of Troeglitz, as xenophobia and anti-immigration sentiments continue to grow in Germany. Many Syrian refugees have been threatened by increasing hate speech and hatred by some parts of German society. "The bitter truth is Troeglitz is just the tip of the iceberg. In 2015 we have already witnessed 20 attacks against refugee shelters," Germany's Federal Minister of Justice and Consumer Protection Heiko Maas tweeted on April 5. "Numerous racist attacks in 2015 show that we should never stop defending our democracy against the smear campaign of extremists," he stressed. Europe has pledged the resettlement and humanitarian admission for only 34,722 of those who made their first application to receive safety and protection. With neighboring countries of Syria struggling to cope with the influx of refugees, European countries have been imposing restrictive measures on Syrian refugees by introducing resettlement quotas. Regarding Syria's neighboring countries, the U.N. refugee agency has called on European countries to do more to share the burden with the international community on the Syrian refugee problem. Even though the number of Syrians who have fled from violence has been increasing, the percentage of refugees heading to Europe remains small, around 4 percent of Syrians having sought asylum in European countries. Neighboring countries – Turkey, Lebanon, Jordan and Iraq – are home to over 3 million Syrian refugees, a number far higher than the total number of Syrian refugees that have sought shelter in Europe.